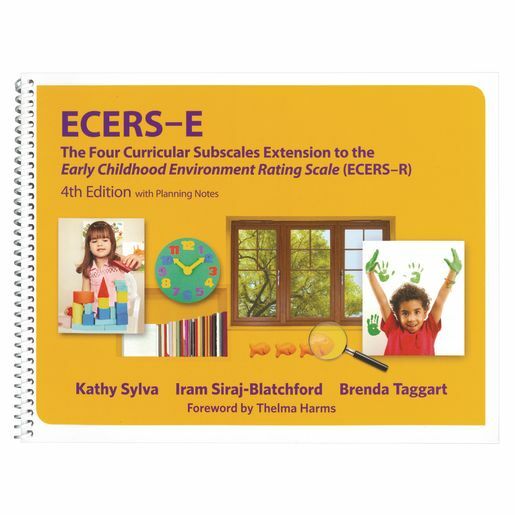 ECERS-E is designed to be used with the Early Childhood Rating Scale-Revised (ECERS-R), an internationally recognized measure of quality in education and care written by Thelma Harms, Richard M. Clifford, and Debby Cryer. It not only complements the ECERS-R but extends the scales to provide additional insights into important aspects of literacy, mathematics, science and environment as well as practices related to issues of diversity. Given the current focus on emerging literacy and numeracy skills, the ECERS-E provides unique guidance on the kinds of environments that enhance learning in preschool settings. The curriculum domains within the scales bear important relationships to children's (age 3-5) cognitive and social/behavioral developmental outcomes. Using the ECERS-E alongside the ECERS-R gives users a more complete picture of what a high-quality early childhood education program can look like. It can be used by program directors, teaching staff, agency staff, and in teacher training programs.